Fiber Flux: Interested In Making Money Teaching Crochet? Book Tour Review and Interview With the Author! 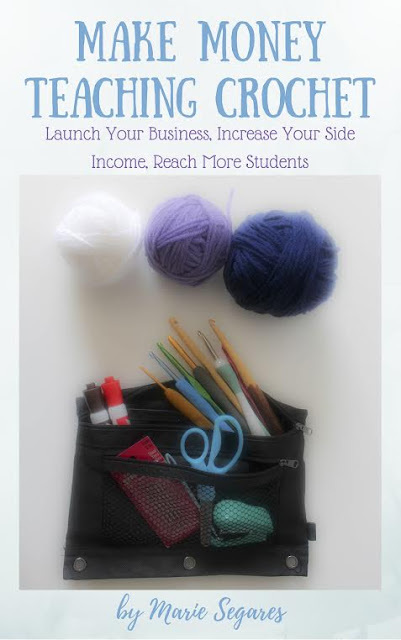 Interested In Making Money Teaching Crochet? Book Tour Review and Interview With the Author! Book cover image courtesy of Marie Segares. A review copy of this book was provided by the publisher. Although I accepted this product for review, I did not receive any additional compensation and all opinions are my own. Hello lovelies! I have a treat for you today! 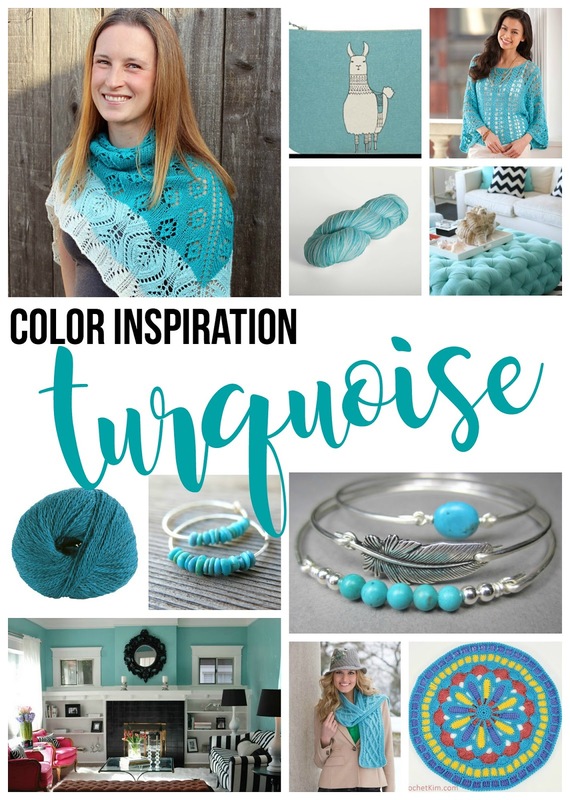 My fabulous bloggy friend Marie Segares of Underground Crafter and the Creative Yarn Entrepeneur Show podcast, has written a book! Entitled "Make More Money Teaching Crochet: Launch Your Business, Increase Your Side Income, Reach More Students." If you've ever been curious about how to earn money teaching crochet to others, this is the book for you! There is so much information packed in to this handy reference to get you started. From the all important planning stages to implementing and following through with your plan of action, this book will set you up for success. I especially love the hands on approach with the included worksheets and forms...an all inclusive resource! I was so excited to be able to catch up with Marie and ask her all about the book in a quick interview. Thank you so much for joining us today Marie, we're so happy you're here! (Be sure to read her bio further down too). Jennifer: What inspired this book? 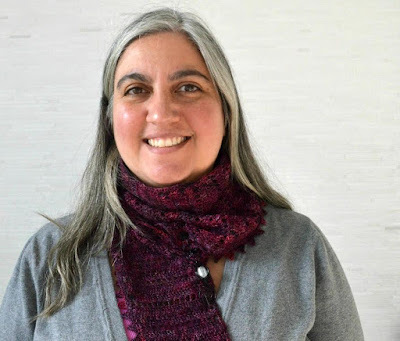 Marie: I started my crochet business as a teacher in 2008, so teaching is close to my heart. I’ve learned so much since then and I’ve also had the great fortune of getting to know other crochet and knitting teachers. I think teaching is such a wonderful opportunity for anyone with a crochet business and I wanted to share some of what I know with other crochet business owners out there. Jennifer : I agree! Teaching people to crochet is such a rewarding experience, what do you love most about it? Marie: I’m really introverted so my answer may surprise you. I love meeting people while I’m teaching and hearing their stories. People want to learn to crochet and improve their crochet skills for really important reasons – to make gifts for loved ones, to welcome new family members, to sell things to earn a side income. I get to be part of helping my students make those important projects in their lives. And, most of them are really nice! I get to meet a lot of people I wouldn’t otherwise know and am honored to call some of my longtime students friends. Jennifer: That is really wonderful how you've touched so many lives with crochet...who taught you how to crochet? I learned to crochet from my maternal grandmother in 1984. She actually attended a trade school for needlecrafts during the Depression and was a master of all needlecrafts. This was actually my biggest problem when I started teaching. I couldn’t remember how I learned and as a result, I had limited patience and wasn’t able to explain the nuances to my students. When I went through the Craft Yarn Council’s Certified Instructor’s Program, our teacher suggested that we practice with our non-dominant hand to get a reminder of how hard it is to crochet as a beginner. That really put things into perspective to me and helped me to get started as a teacher. Jennifer: That's great advice! So now we have to know, what is on your hook at the moment? Marie: I’m actually working on two projects because that’s how I roll ☺. One is a hat using Craftsy’s new yarn, Cloudborn Fibers Superwash Merino DK. The other is a bag in Bernat Mega Bulky. Jennifer: Sounds lovely! Where can we find your book? In what formats? You can find more information about the book at http://creativeyarnentrepreneur.com/mmtc. Right now, it’s available as an ebook on Kindle and Kobo; as a print Workbook Edition with 15 worksheets via Amazon or Createspace; and as the Ultimate Printable Edition, a PDF ebook with 15 worksheets and 5 customizable forms for your crochet business. Thanks Marie! It was a pleasure having you here at Fiber Flux today! Thank you! Image courtesy of Marie Segares. Next stop on the book tour is my bloggy pal Amy over at The Stitchin' Mommy, stop by and say hello!